It's as small as the Lotus of the same name, but this upspec Nano can fit a little bit more in - for a lot less. What is it: The five-grand mini car for the masses. The four-door, four-seat Europa is driven by a three-cylinder all-aluminium fuel-injected engine (the Indian model is a two-cylinder), with a standard five-speed auto and sub-100g/km CO2, which should have it in the four-litre per hundred slot. It also gets Pirelli rubber, ABS, ESP and at least dual airbags, but no word yet on what is standard or optional. Or whether Lotus will let Tata keep the name. We think not. 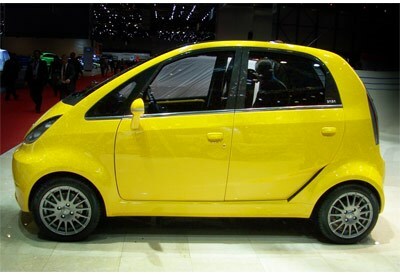 Tata Nano Europa, for future launch in international markets, displayed at 79th Geneva Motor Show. Geneva, March 3, 2009: Tata Motors today presented at the 79th Geneva Motor Show the Tata Nano Europa, intended for a future launch in select international markets. The company has also displayed the Tata Prima, a concept luxury sedan, and the Tata Indica Vista EV, an electric vehicle based on the award-winning new generation Tata Indica Vista. Speaking on the occasion at the Geneva Motor Show, Mr. Ratan N. Tata, Chairman of Tata Sons and Tata Motors, said, "In India, the Nano will be launched on March 23, and the cars will be on display at company dealerships from the first week of April. The Nano has also generated wide interest in developed countries, since it's unveiling in Delhi and its presentation here last year. We are delighted to present the Nano Europa for future launch in such markets. The Indica Vista EV represents the work of Tata Motors on alternate technologies, while the Prima is an iteration of a luxury sedan we will introduce. They together signify the ongoing evolution in our cars." With a length of 3.29 metres and width of 1.58 metres, the Tata Nano Europa continues to be stylishly petite but surprises with its spacious interior and generous leg space. The slightly longer wheelbase of 2.28 metres combines excellent space and manoeuvrability, further improving on the benchmark standard set by the Tata Nano. The enhanced spaciousness is complemented by redesigned interiors, marked by smooth curves and a high tech yet gentle feel. To meet the driving needs of its target customers, the Tata Nano Europa will be powered by a 3-cylinder sporty all-aluminium MPFI engine matched with a 5-speed automatic transmission, and electric power steering. The gasoline engine will be class-leading, providing high fuel efficiency and low CO2 emission of less than 100 gm / km meeting the twin goals of being environmentally friendly and stylish - just like the Tata Nano. The Tata Nano Europa meets all safety regulations. In addition to the all sheet-metal body, its energy absorbing design, use of advanced restraint systems, ABS, ESP and Air Bags will enhance passenger safety. Just like the Tata Nano, the Tata Nano Europa incorporates exterior compactness with interior comfort and seeks to provide motorists the pleasure and utility of personal mobility combined with affordability and environment-friendliness, in a world where smaller, fuel-efficient cars are emerging as a preferred choice.